Hi! My name is Amanda Brown, founder of Homepreneur, helping you benefit from my experience of the past 20 years of working from my home office. During that time I have seen the rise of the internet, the impact of social media and the benefits of outsourcing on starting and growing a business. I have also seen the effect of the banking crisis in the last 10 years and the increasing dissatisfaction with corporate life. For both women and men, leaving corporate life to raise children, throws up many challenges including affording childcare and also the difficult – some might say, impossible decision between returning to their original careers with starting something new. There are also the baby boomers who may have reduced their formal working hours or even retired but who have the desire to use their vast experience, knowledge and zest for life, as well as a need to supplement small pension pots and start turning their passions into profits. Over the years I have run three successful ‘kitchen table' businesses. There have been times when I have started new projects which have turned out to be less than successful but from which I have learned a great deal. 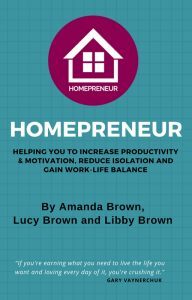 At the beginning of 2018, I set out to write the Homepreneur book,a guide to helping people overcome the challenges of working from home. My co-authors are my daughters, Lucy, who is a freelance journalist and Libby who works in international development. The Homepreneur book will be published at the end of 2018.